James Hardie has been in business for more than 125 years. Their siding is currently protecting, and providing beauty, to more than 5 million homes. If that’s not enough to convince you to consider James Hardie Siding for your home, here are a few more reasons. James Hardie Elite Preferred Contractors: When you work with a certified roofer, you know that you are working with BBB accredited, financially stable, properly licensed and insured, and highly trained professionals. You won’t have to worry about high pressure sales tactics, installations that aren’t going to hold up under warranty claims, or getting caught up with a contractor who can’t live up to their commitments. Durability: There is a James Hardie siding product that is designed for the exact climate you live in. We can’t control Mother Nature. But, you can have the confidence of knowing that your siding has been tested to survive the worst that she can throw at your home. You won’t ever have to worry about sun, snowstorms, or extreme winds. Nothing is more rot and moisture resistant, and you won’t find another siding product that maintains its color longer, thanks to the company’s unique ColorPlus® Technology. Fire Safety and Pest Resistance: Fiber cement does not ignite when it is exposed to flames, so if you do have a fire, your siding will not add fuel. And, it can help protect you from flames outside your home. 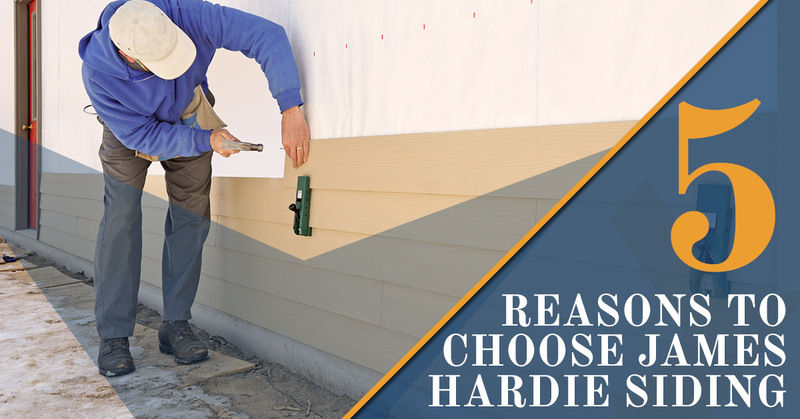 Additionally, the critters that typically damage wood or composite materials are just not interested in James Hardie Siding. Fiber Cement is just not appealing to them, so they’ll leave your home alone and move on to the next one. Savings: Over time, you are going to save money with fiber cement siding. Because it is more resistant to the things that damage other types of siding, you won’t have to pay for repairs caused by mold, swelling, cracking, or other problems that are common with other types of siding. As an added bonus, you may save on your homeowner’s insurance thanks to the fire-resistant properties of fiber cement. Warranty: James Hardie is so confident in the quality of its products that they offer a 30-year warranty on all siding and a 15-year warranty on trim products. The final reason to consider James Hardie siding for your home is that Golden West Exteriors is here to help you choose the right siding for your home, give you the confidence that you get working with an Elite Preferred Certified Contractor, and guarantee that you’re going to be happy with your home’s new siding for many years to come. Give us a call soon. We look forward to working with you.